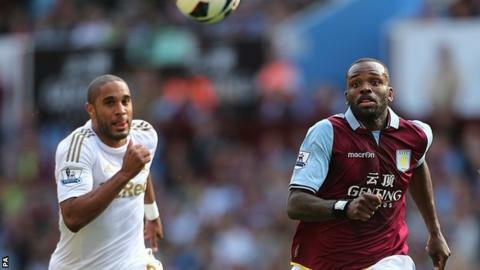 Swansea boss Michael Laudrup suggested that the trauma of Wales' 6-1 defeat in midweek may have contributed to Ashley Williams' blunder against Aston Villa. The centre-back's weak header let Villa striker Christian Benteke seal a 2-0 Premier League win and condemn Swansea to their first loss of the season. "Ashley is a super guy but he has had a very severe week," Laudrup said. "When... at the start of a World Cup campaign you lose two games and one result is very savage, it hurts." Wales began their qualification for the 2014 World Cup with a home defeat to Belgium - where new £7m Villa signing Benteke was an unused substitute - then suffered a surprise hammering away to Serbia. Williams' miserable week was concluded with the result at Villa Park, which saw the home side claim their first Premier League win of the season at the expense of Swansea's unbeaten record. "Four or so days later [after an international] you have to play a tough away game," Laudrup added. "I think he [Williams] did well. Of course, it was a mistake at the end but, whether it was one-nil or two-nil, doesn't make a big difference. "I said to him afterwards to now go and relax and I am sure knowing him he will come back after a couple of days with his family and have a huge game against Everton." The Danish boss refused to be downcast after Swasnea's first defeat of the campaign: "We know we will lose games. "The important thing is that we created chances and were in the game until the last two minutes. I cannot be disappointed. A first defeat had to happen one day."